You have had quite a varied career – from writing for women’s magazines in the UK to your current role as a principal at a school in India. Tell us a bit about yourself and your journey to where you are now. I was born and brought up in London, though my parents are Sri Lankan Tamils who moved to the UK in the 1970’s. They managed to move before Sri Lanka’s civil war broke out, so they are familiar with many of the heartaches attached to belonging to a country which is in turmoil. I have always enjoyed writing, but I can honestly say it was after I became confused about what type of career I should have that I felt God tell me to consider journalism. After that my confusion seemed to evaporate. After taking a course in journalism, I went to my local newsagent, picked up a few magazines that interested me, and wrote to them asking for work experience. That one act led me to my first job writing for women’s health magazines. After a few years, a friend told me about a vacancy at Take a Break magazine. Autobiographies and biographies have always been my favourite book genre because I love understanding people – their motives, their emotions, how they deal with different experiences. Writing for a true-life magazine was a job I knew I would love to do. During my time there, I heard so many amazing stories and I always felt there was so much to learn about human nature and from the experiences of other people. It was during my time at Take a Break that I decided to go on a missionary trip to Peru to work with street children. The trip had a profound effect on me. I knew then that I wanted to do something significant with my life and would love to be a missionary one day. It was around this time that I met my husband Joshua, who lived in the USA. We married and we moved to LA, California. During that time, we started our family and, while I was pregnant with my second child, I began the manuscript for My Country Wept. Being a housewife with young kids, I had some time to write. It was also during this time that me and my husband heard God speak very strongly to us about going to live and work India, which is where my husband was born. We didn’t know what we were supposed to do, just that we were supposed to go. We went to stay with my husband’s father who runs churches, children’s homes and schools. It’s from this beginning that God has slowly given me and my husband a vision for developing high quality Christian schools in India. I help with the schools in my role as a principal to help govern the vision that we have. My writing is still useful for marketing purposes, so I still continue to use my writing skills. In all honesty, I felt like God has guided me in each step of my career and work and ministry. I’ve found myself doing things I never thought I would, but I trust Him and have learnt to embrace His leading. You have a passion for writing true life stories – why is that? Everyone loves stories but I think there is nothing more captivating than a true-life one. I love getting inside a person’s head and being privy to how they are feeling and why, and understanding their experiences from their point of view. I feel we have so much to learn from the experiences of other people – there is wisdom to be gained. More than that, I feel like the true-life stories of God’s children, their testimonies, are the most incredible stories we will ever hear. That’s why I jumped at the chance to tell Theo’s story. You have written many articles on true life stories, but My Country Wept is your first book. How was the experience of writing a book? It was definitely a far longer process! It took me almost six years to complete the full manuscript as I started when I was pregnant with my second child and finished when she was 5 years old. It was more the process of recording the details of Theo’s testimony in-between both his job and my daily responsibilities as a housewife, that made it time-consuming. Another difference is the book seemed like a dozen different little stories inside one big one. There was just so much that I valued from Theo’s testimony that the very story itself compelled me to keep writing. 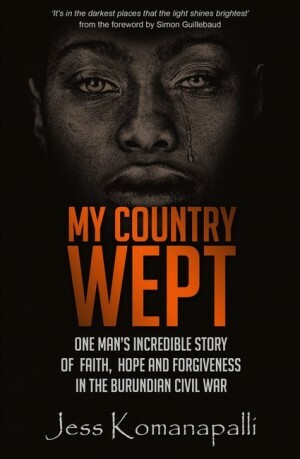 My Country Wept tells the story of Theo Mbazumutima; how did you come to meet Theo and discover his story? My good friend Alison is a missionary in Burundi. She introduced me to Theo when he came to preach at her church one day while she was in the UK. She told me he had an amazing testimony and that I should hear it. I remember her briefing me on some parts of his story and thinking, ‘wow, that’s an incredible story!’. Later on, she mentioned Theo again and said he was looking for someone to record his story. Since I was a housewife at the time, I agreed I would help him. Because of my past experience in writing true life stories, I was sure I could help him record his testimony in a way he could easily share it with other people. As you live on different continents, how did you manage to capture Theo’s story - and what were there particular challenges in uncovering all the details? When I first started writing Theo’s story, he was in Africa and I was living in the USA. We would Skype for a couple of hours and I would take down as much of his story as I could. It was a lengthy process as sometimes his internet would die or my toddler would need attention. I also wanted to make sure I had as much detail as possible from names of places and people, to even the smells and sights he witnessed at particular times. When I moved to India in 2011, we had two struggling internet services and continual power cuts to deal with. It was often frustrating as this was just the note -taking process and it was literally taking years to do. Finally, in 2013, Theo came to visit me in India so I could concentrate on taking down the rest of his testimony in one go as the process seemed to be taking too long. We committed a whole week to finishing it, and then I was able to concentrate on writing the rest of the manuscript. In all honesty, I loved talking to Theo about his experiences and how he felt and coped during different times in his journey, and also what he felt God was teaching him and working in him. I would always feel massively encouraged and inspired after speaking to Theo, and I was confident his story would have the same effect on others. One of the biggest challenges of writing Theo’s story was trying to get him to dig down and remember little details of events or conversations or how he felt at certain times. But Theo was always willing to do what was needed to help recall or find things out. He would often come back to me again, having contacted a friend who would remember details or having spoken to someone else that could help. It was important to us both that his story was factual, honest and not exaggerated or dressed up in any way. You write Theo’s story in the first person rather than the third person as is often the case in biographies – why did you choose to do this? It’s probably because I had become well-crafted in writing true-life stories in the 1st person style. When I heard Theo’s testimony, I also thought the 1st person format would work amazingly to convey it. I felt his testimony and his inner journey with faith, etc, was something that would be best expressed in his own voice and through his own eyes, rather than an observer’s. Theo’s story is set against the backdrop of the Burundian Civil War – is this essentially a book about historical events or does it have relevance to us today in the UK? Without doubt, Theo’s story has relevance today. The war is just a backdrop for situations and crises we all go through. This is a book about God’s love for all of his children. It’s a book about faith in trials, about the power and beauty in the acts of repentance and forgiveness, about God’s ability to rescue us from, and even use, our most difficult and painful experiences, and about the good purposes and plans God has for each one of our lives. Anyone who reads Theo’s story will be amazed about the faithfulness of God and Theo too – but what strikes you most about Theo and his story? What strikes me most about Theo is that he has endured and experienced so many traumatic and unbelievable hardships, but he has emerged from it all with a strong faith and commitment to God, and with a desire to help transform the lives of other people. Not everyone who has been through the things he has, has turned out the same way, or with the same outlook or same testimony. I also really valued Theo’s honesty and humility when sharing his testimony. He was always adamant that he shouldn’t be made a hero in any way but was open about his failings and about the times when he was angry with God or doubted Him. Instead, Theo always pointed to God as the hero in this story. In person, Theo is a very sweet, caring man, and also a very intelligent one. God has gifted him in many ways and he is using his gifts and talents to serve refugees and returnees in Burundi. I also think another striking thing about Theo’s story is the way God continually showed up in the most unexpected and unimaginable ways during his journey, especially when things seemed so hopeless. It’s just a reminder that when we submit to God’s plans for our lives, He can rescue us from any circumstance and work in every situation. We can never fathom the reasons why some things happen as they do in our lives, but God somehow works everything together for good and for His purposes, just as His word says. This can be seen so clearly in Theo’s testimony when he looks back at times when he suffered, but saw purpose in them later on. How is the book different to other biographies? Firstly, every story is unique - there is always something to learn from each person’s experiences, challenges and growth. But I also think that Theo’s story is also one of the most incredible stories I have ever heard. It’s one where I found myself continually gasping at the situations he found himself in, wondering how he would escape them, and I was equally in awe of the way God showed his power and sovereignty through them. Even today, for me personally, it is one of the most encouraging testimonies I have ever heard. Theo’s experiences also offer readers a window into some of the suffering and tragedies of civil war that goes beyond what we hear in news stories. It is quite an unusual title – what is the significance of the title? The title depicts the utter tragedy of a country in civil war - a war that brings people to commit such atrocious acts of hate and violence against each other. Burundi is such a beautiful country, with beautiful people and a beautiful culture. But the civil war turned friendly neighbours, that had once lived in peace, against each other. They didn’t just hate each other, they murdered each other in the most horrendous ways. Civil war is such an ugly thing. I am sure our Heavenly Father weeps over the evils and suffering of a country at war. And I don’t think there is anyone who takes pleasure in or gains from it. Everyone hurts in a civil war. The title My Country Wept conveys this tragedy, where a beautiful country, that should be a place of peace, instead becomes a place of bloodshed, horror, chaos and violence because of her own people. What do you hope readers will get out of reading My Country Wept? I hope readers of this book will be extremely encouraged in their faith when reading My County Wept. Deciding to serve God in India, away from my loved ones in the UK, and with no real plans ahead of us, was certainly a journey of faith for me and my husband. But when we have encountered difficult times or needed to believe in God for provision, Theo’s testimony has always come back to me. It’s helped me remember just how powerfully God can act on our behalf to intervene in any situation and to direct our paths. It’s helped me remember that God is able to answer our prayers in incredible ways and that he truly has a good plan for each one of us, if we would just seek Him and submit to His leading. I also hope it challenges those who are struggling with issues of forgiveness or repentance to allow God to do a work in their lives which will bear much fruit, just as Theo did. My Country Wept is due for release 8th March 2018, and can be pre-ordered today.